Fly stitch is a basic surface embroidery stitch that you can work singly, as a scattered filling, or in rows. You can also work it with some variations, making it useful for stitching different types of lines with cleaner and fewer stitches. Each fly stitch is composed of two stitches—a horizontal long stitch, which becomes a V, and a vertical tacking stitch. To work a single fly stitch, bring the needle up through the fabric (point 1) and then down a short distance away (point 2), leaving a loop on the surface of the fabric. Bring the needle up through the fabric again, just above the center of the loop you just made (point 3). 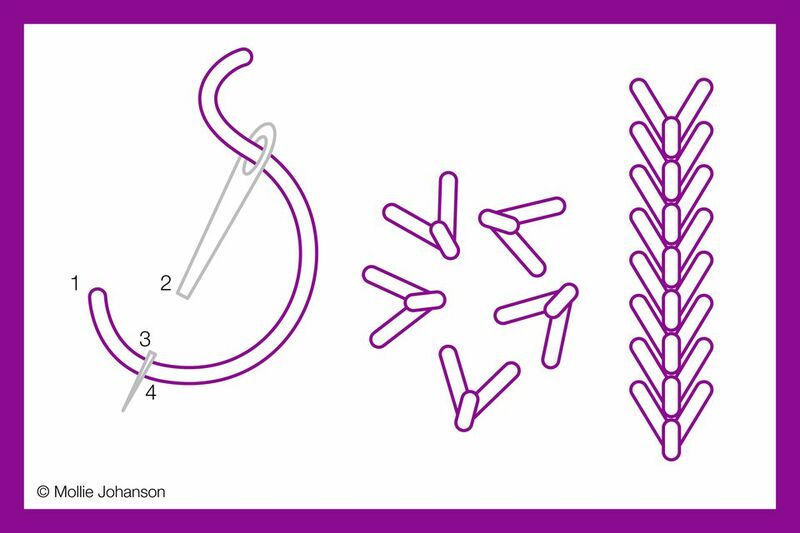 As you bring the needle up through the loop, pull the thread until the loop becomes taut, forming a V. Be careful not to pull it too tight, however, or it will pull in the fabric as well. Insert the needle into the fabric on the opposite side of the loop (point 4), tacking it in place. The diagram shows this stitch worked using the sewing method, but the stabbing method also works well. The standard version of fly stitch creates a V shape, though the degree of the angle on the stitch can change by altering the spacing. A basic fly stitch also usually places the point directly centered between the open side of the stitch, but you can be a little more flexible with that as needed. For example, you can bring the needle up through the fabric and loop of embroidery floss to the right or left of the first stitch. Pull the loop taut and finish the tacking stitch to create a much more acute and angled V.
Rather than a tiny tacking stitch, you can use a much longer tacking stitch to give the fly stitch a bit of a tail. The center example above has a 1/8 inch tacking stitch, but you can even make it longer so it is equal in length to the "arms" that extend above it. This forms more of a Y. For a softer look, you can create a rounded shape. This is sometimes called scallop stitch and it is just a variation on fly stitch. Instead of pulling the loop of thread tight, allow it to rest on the surface of the fabric and bit, forming a curve. You can also form this stitch in two colors. Thread two needles with different colors of embroidery floss and use one for stitching the horizontal loop stitch and the other for the vertical tacking stitch. Fly stitch can be useful for embroidering tiny shapes and angles because you can pull it to a point that other stitches don't always create as cleanly. Often this means using fewer stitches as well. This stitch is good for making fur or feathers on animals or texture on fir trees. When rounded, it's also perfect for stitching tiny smiles or expressive eyes. A line of fly stitches side by side makes an excellent border. You can use the standard version to make a zig zag or the rounded version to make a scallop border. Try combining the rounded version with straight stitches to make a classic postage stamp border. Try using this stitch as a fill by scattering it on its own or with other stitches. 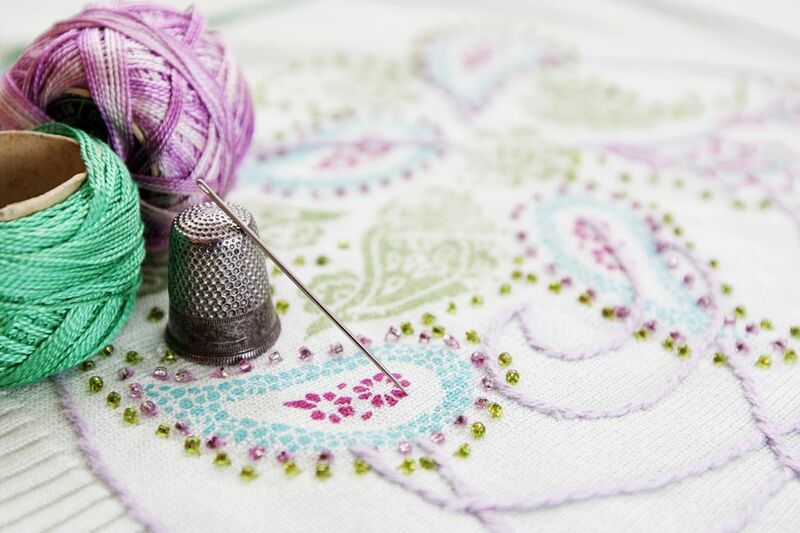 The more you use fly stitch, the more you'll find new and useful ways to make this part of your embroidery!